For interested, all the details of the tournament can be found at http://www.commandsandcolors.net page, HERE. Let us jump to actual games. The first scenario I had pleasure to play with Greg O (gottoman) using wonderful Vassal module v4.1. Btw, all below pictures are clickable / enlargeable if you would like to check the details of the game. 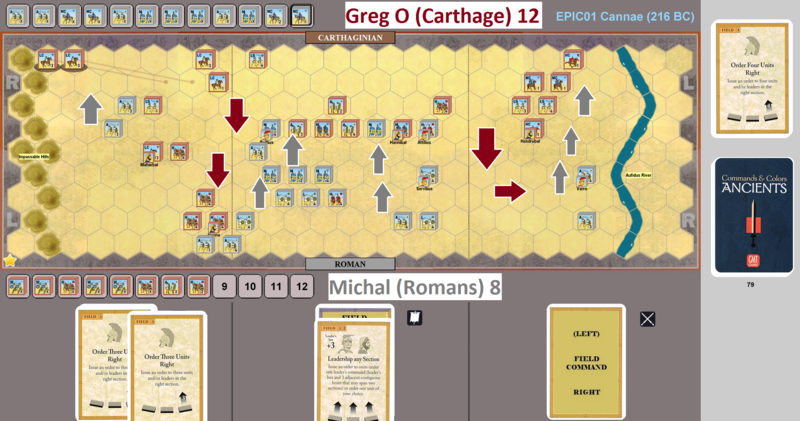 Rome advanced on the right and Carthage battled wsith it's cavalry, ending with 2 Roman Aux and 2 Roman M Cav eliminated before the action moved to the left with a Carthage double time with heavies pushing Rome, who countered with cav on the left into the Carthage Light Cav, who moved to refuse that flank. 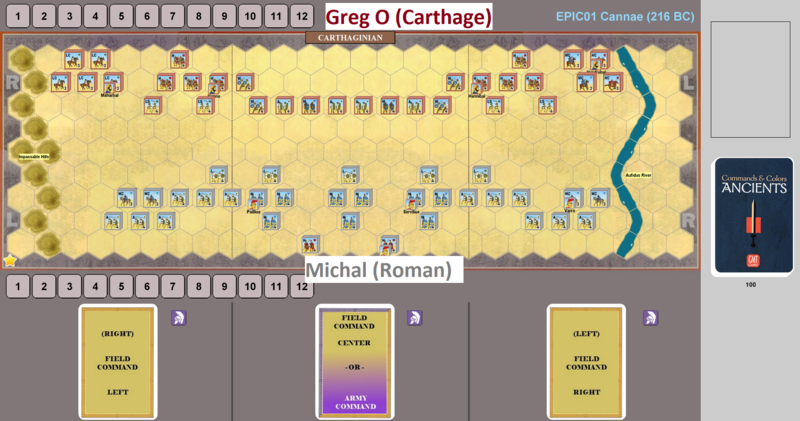 The middle settled into a standoff with several Darken the Skies exchanged and then Rome charged forward and busted a hole in the center of the line but Carthage refused both flanks of the hole and the center settled into an exchange of banners. 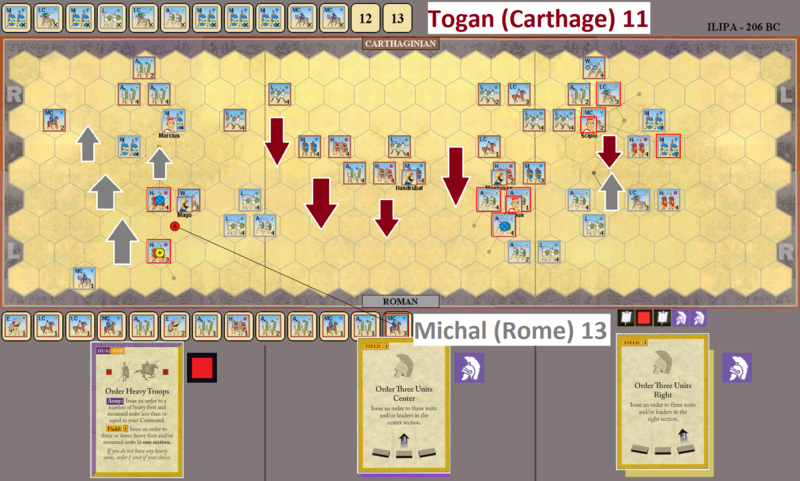 Rome then made a strong push in an aggressive attack, looking for the banners needed to seal the deal in the overall trio of battles. 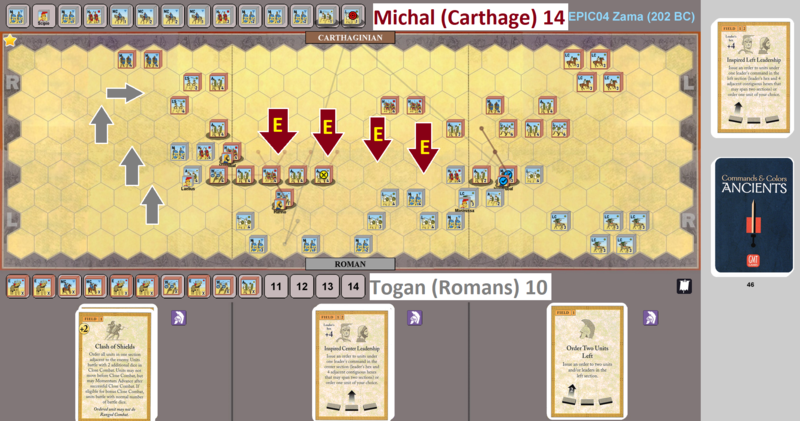 Carthage took losses but pushed back and won the battle, with a group of heavies attacking all the way back to the Rome back row. Great battle, always a blast playing Epic with Michal K and the rest of this crew! Ok, after Zama this time playing as Roman I should have an advantage. Well, that was not so obvious as the historical result suggested – also thanks to Togan, always very challenging opponent. It was very bloody (significant numbers of blocks lost), very close and tense game. And of course it disconnected – EPICs are so long that that is standard on Vassal. Historically, I as Romans attacked on left and right while Togan’s juggernaut in the middle moved forward. 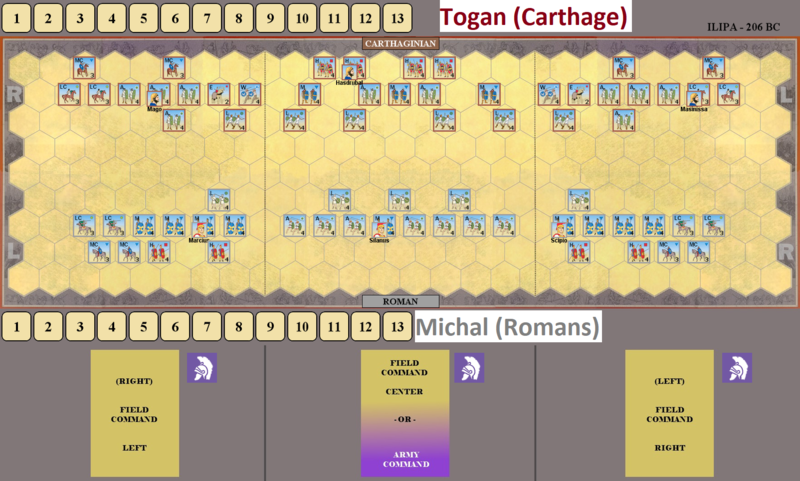 I managed to dispatch both elephants on Carthage side, but every time I thought I am gaining upper hand., Togan were skillfully counterattacking. In the end I managed to get some lead (2-3 banners) and keep it till the end of the game. It took us 2.5 hours and we managed to play in one go. 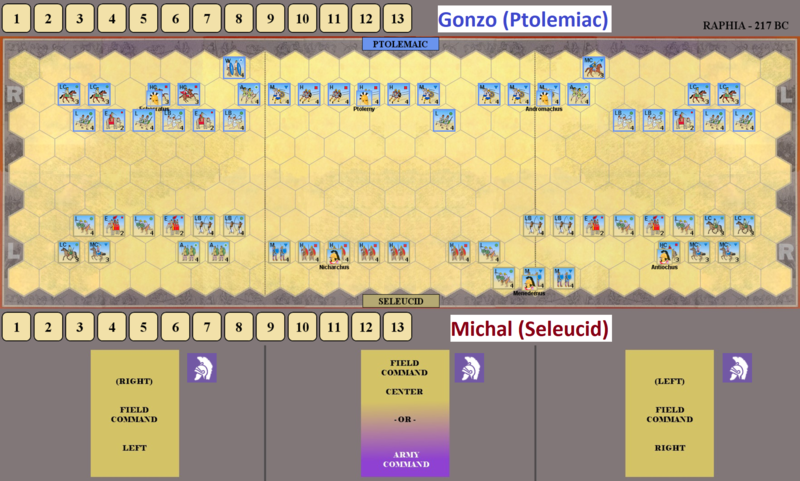 The third scenario from EPIC expansions takes us from Punic Wars into the centuries long struggle between successors of Alexander the Great – or rather, successor’s posterity – Ptolemaic and Seleucid leaders. Our game was specific. We started before Christmas and were halfway through. Unfortunately, the save log disappeared both form my and Joe’s computer (due to different reasons but similarly effective…) So we mobilized ourselves and restarted from the scratch in January. 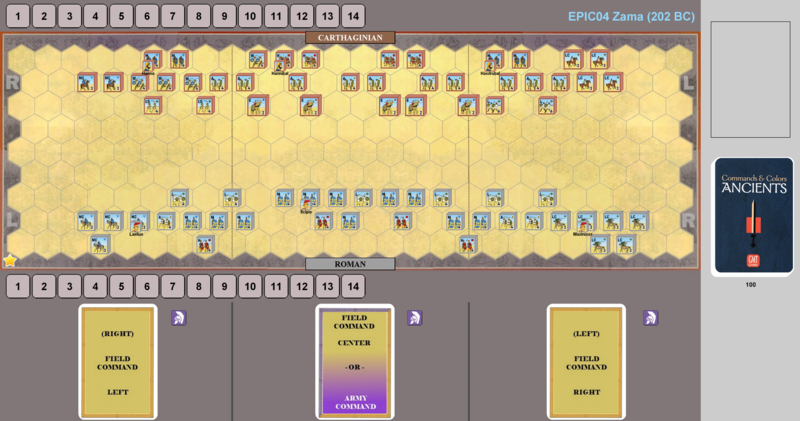 The game – as our first attempt – was mainly driven by very aggressive play of Seleucids on right / Ptolemaic left. 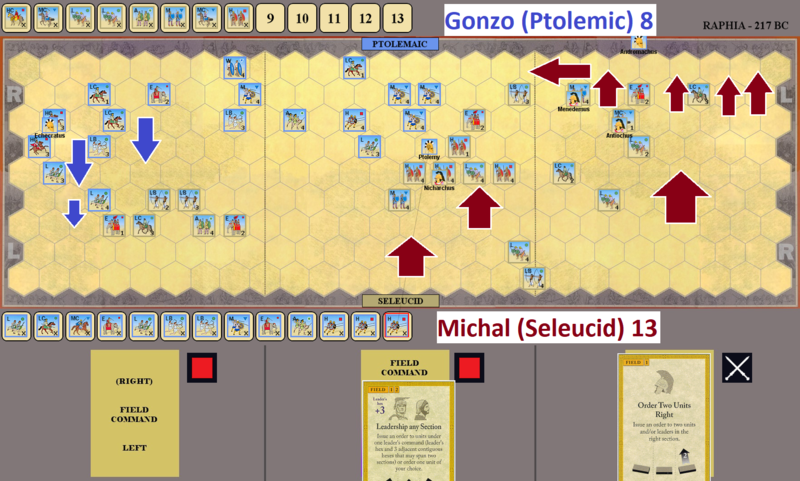 In the end – after some lucky rolls and surviving leader escape – Seleucids completely routed that part of Egyptian forces. I had also two very lucky rolls killing the elephants. On my left things started to crumble (also historically) as many brave Seleucids were killed or tramped by elephants there. The game ended after clash of phalanxes in the middle, DT by Joe and my counter attack. Great, ling and exciting game – thanks! Sounds like I will play Togan again – this time in final! The final game had a real jewel – Zama – balanced scenario, requiring 14 banners to win, with lots of opportunities and – !!! – multiple elephants! Rarely I have seen so effective elephants in action. First game 14-10 to me. That was very exciting and interesting game. The number one unit in the game was definitely ELEPHANT. What those guys did was beyond my wildest expectations: they shattered whole Roman center and killed Scipio Africanus. All that in first three turns. However, Togan is experienced player so he counter-balanced this by attack on my right with his superior cavalry – attack repulsed with significant loses. On my left / Rome right almost no action was seen, but at the end of the game the last points for victory were scored there. Very, very tense game and a lot of fun! This time elephants were also dangerous but not so much effective. 14-11 to Togan. That was a really exciting 2,5 hours… We started slowly, I managed to put some lights to prevent dreadful Elephants in center – two of them were even dispatched. I lacked cards on left so my Med Cav was immobilized. I tried to attack with Numidians on right – the strange range rolling (3 hits on three 1-dice rolls) was a nice beginning but then I was repulsed. It was like 3-3 when things started to get messy. Really messy – Elephants got Mounted Charge, my Light Cav on right was shattered and it was 3-7 before I realized what is going on. That was high time to do something – all my surplus from first game was gone. So I planned and executed a round which I will remember for a long time… Two Double Times plus Mounted Charge which scored me 6 points and moved the result to 9-7. So you think it is easy now? Only two points to secure victory? And you have attack on lonely, unsupported 1 block medium cavalry, with your full-strength MC and leader? Piece of cake… unless you miss totally, and battle back wipes-out your cavalry AND leader. Last turns was kind of cat-and-mouse, very tense play in which, somehow, I managed minimally to prevail. I really like EPIC format – there is time, place and possibility to plan long-term, the leaders are really precious and simply, you cannot win by sheer lack due to number of banners. Thanks to all players I had opportunity to meet as well as Mark who organized everything.